WTF or WHAT THE FLUSH! The makers of the Stealth® ultra-high efficiency toilet and Bravo’s “Flipping Out” Star Jenni Pulos want to see more people saving both water and precious dollars when they flush. On average, 27 percent of water consumption in the home comes from flushing it right down the toilet, which is completely avoidable – that’s not even mentioning the water lost by old or deteriorated flappers that leak. Niagara Conservation Corp. created the Stealth Toilet which uses less than one gallon of water per flush (0.8 gallons per flush to be exact) relative to the average toilet that uses 3.5 to 5 gallons per flush. “As a California resident, I feel the gravity and importance of water conservation. That’s why I’m asking America to stop this invisible drain on our planet,” said Pulos. “With the Stealth Toilet we can do our part to save water and money with every flush. So join the cause for water conservation and say it with me – #WhatTheFlush!" 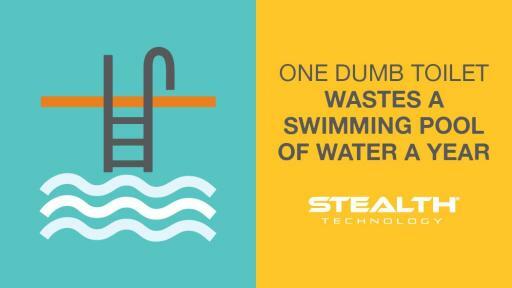 Not only does the Stealth Toilet save up to 20,000 gallons of water per year – enough to fill an 18-foot by 40-foot in-ground swimming pool – it can cut down homeowners’ water bills by up to 60 percent without having to change their bathroom behavior. Homeowners in dozens of cities across the country can recoup some, or in many cases all, of their replacement costs with rebates from their water districts. The Stealth toilet sells for $149, but a statewide California rebate of $100 to every homeowner makes this purchase even more affordable. Log onto http://www.saveourwaterrebates.com/toilet-rebates.html for complete details. As part of the #WhatTheFlush campaign, Pulos and Niagara Conservation Corp. have set an ambitious goal: They want to help Californians save at least 1 billion gallons of water in 2016. The company is inviting the public to suggest projects or people in the state who could benefit from donated Stealth Toilets and free installation. To nominate or make a recommendation, just Like or follow Niagara Conservation Corp. on Facebook and/or Twitter. Use the hashtags #WhatTheFlush and #CAStealthDonations to share ideas. Niagara Conservation Corp. will consider any and all suggestions for its first project. Even homeowners who have already installed so-called “high-efficiency” toilets can reduce water use by an additional 35 to 50 percent with the Stealth® ultra-high-efficiency toilet. Around the world, the call to conserve water is growing more urgent. The United Nations has predicted serious water shortages by 2030. And while California is showing signs of recovery from its extended drought, water levels in the state’s reservoirs are still below average – and many experts say it will take years to recover. The Stealth® toilet meets EPA WaterSense® criteria and MaP™ Premium Maximum Performance standards. It sells for $149 at Home Depot and is available in a variety of styles. Visit www.WhatTheFlush.com to learn more about the Stealth Toilet and see Jenni Pulos star in a cheeky “Potty Talk” video. With a history of nearly 40 years of quality and innovation, Niagara Conservation has earned a reputation as a premier manufacturer of high-efficiency & ultra-high-efficiency conservation products, developing conservation solutions for plumbing professionals, utility companies, government leaders, energy management officials and environmentally conscious consumers. Founder and President William Cutler established Niagara in 1977. The company is still family owned and headquartered in Flower Mound, Texas, with satellite offices around the world. For more information on Niagara’s water-saving and energy-saving products as well as its patented Stealth® Technology visit www.niagaracorp.com or call (800) 831-8383.